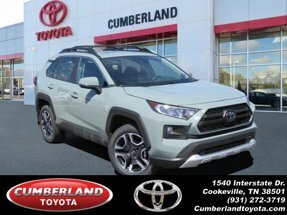 Description A well-rounded blend of utility, efficiency, and style, our 2019 Toyota RAV4 Adventure AWD SUV presented in Lunar Rock is an ideal choice for you and your on-the-go lifestyle! It embodies value and functionality and is powered by a spirited 2.5 Liter 4 Cylinder that offers 176hp paired with a 6 Speed Automatic transmission and available Dynamic Torque-Control. Pick your adventure and get going; you'll love the smooth, confident handling in our All Wheel Drive and will be smiling with an excellent efficiency of near 30mpg on the highway. Our popular crossover has sporty good looks that encourage you to get behind the wheel and take command of your day! Take a look inside our Adventure trim to see this RAV4 radiates premium good looks inside and out with a spacious cabin equipped to manage your daily grind. You'll appreciate remote keyless entry, huge sunroof, the Entune Audio multi-media bundle/Bluetooth/voice recognition, an integrated back up camera, and soft touch accents that make each ride feel incredible! Designed by Toyota to support your awareness and keep you out of harm's way, our Toyota Safety Sense combines a pre-collision system, lane departure alert, dynamic radar cruise control, and other safety features. With dynamic good looks, a get-it-done demeanor, and optimal versatility, our RAV4 is a practically perfect choice! Print this page and call us Now... We Know You Will Enjoy Your Test Drive Towards Ownership! Call or text 931-881-7079 for more information.